Through reading the following content you’ll learn how to safely uninstall this program, in two different ways. Click the Start button, and enter “Control Panel” in the search box (Or right-click the Start button, and select Control Panel). Click the Uninstall a program link under Programs. 3. 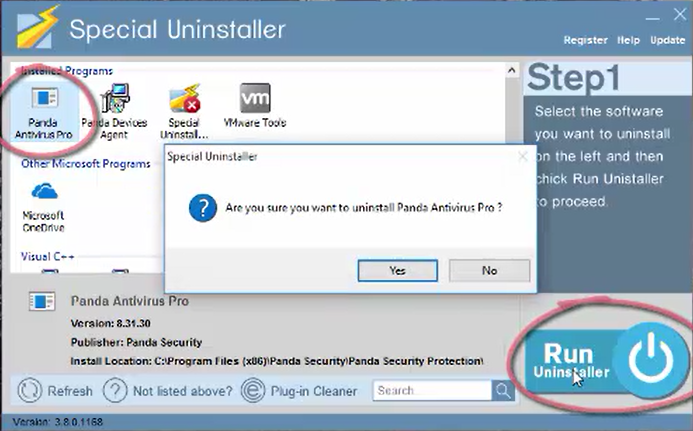 Remove Panda Antivirus Pro 2019 by activating its built-in uninstaller. In the list you will see all the programs you’re having in the system. Just find and double-click Panda Antivirus Pro to start the removal, after which go back here and perform the same steps to remove the rest of them. Click the Next/Yes/Uninstall/Remove button to proceed, tick all the items presented, click Next, and wait until the uninstall wizard finishes its job. Press and hold the Windows key + C on your keyboard, and you will see the Charms pop up from the right side of your screen. Select Search, and enter “regedit” in the box. 6. Find and delete the registry entries (leftovers) of Panda Antivirus Pro. You can choose to back up the registry first in case of any mistaken deletion: On the navigator click File > Export…, type a name and save the copy to a location. To check for other possible leftovers: on the navigator click Edit > Find…, enter “Panda Antivirus Pro” in the search box. 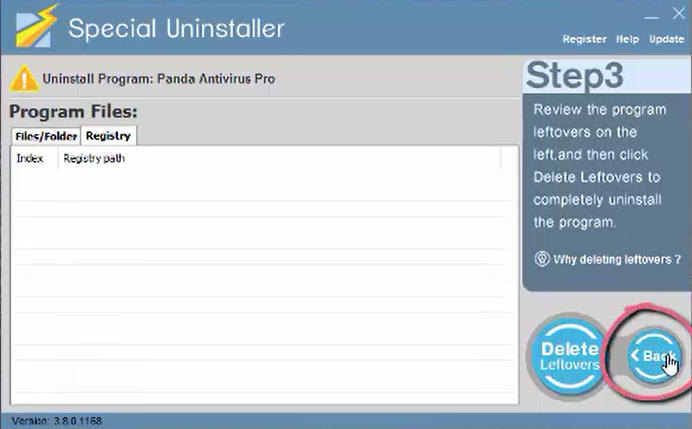 Delete them (if found) to completely remove Panda Antivirus Pro 2019. Then you can go to the System Tray, Start menu, Programs and Features, etc. to check whether the program has been completely uninstalled. Can I Remove Panda Antivirus Pro 2019 More Easily? Click any of the blue download buttons on the page or visit the homepage to download & install this removal tool. 2. Remove Panda Antivirus Pro 2019. Double-click its desktop icon to launch it, you will know what programs are currently installed on your PC. Find and select Panda Antivirus Pro as your target, and click Run Uninstaller to scan for all the related files. 3. Remove the lingering files. Confirm the removal. 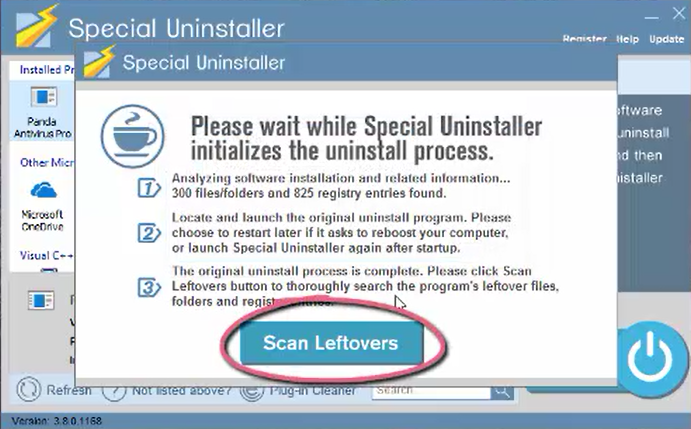 When it says “Please wait while Special Uninstaller initializes the uninstall process.” Then you can click Scan Leftovers to scan for its leftovers, and click Delete Leftovers at last to completely remove Panda Antivirus Pro 2019. Clicking Back will bring you back to the program list, then you may check whether Panda Antivirus Pro has gone from your PC. Now you can read on to learn some basic maintenance skills that may benefit your PC performance. How to Prevent PUPs and Optimize Your PC? According to the feedback of some users, Norton doesn’t block the pop-ups of what was already installed or they unknowingly installed. Some applications are not malicious by the criteria of Norton or that of other antivirus software, so I think the best way to prevent the unwelcome programs from getting in is to pay more attention when you visit a web page, open an email, download and install an application. Keep your Windows up to date – Average users can install updates without the help of professionals. Modern versions of Windows are even set to install updates automatically out of the box, so you may not even have to do any of this updating work yourself. Free up space by removing files and programs – If you’ve been using your machine for a while, you can probably free up disk space by removing the redundant files, and uninstall the needless programs by using Special Uninstaller, just like you can easily remove Panda Antivirus Pro 2019. Optimize Startup – Open Task Manager (right-click the task bar and select Start Task Manager), and click over to the Startup tab, to easily manage your startup programs without installing any other software.